Looking for Gold! Columbus arrives in Costa Rica on his last trip to the Americas; Natives greet the “conquistadores” wearing golden pieces on their chest and ears, and so the land got the name of “Rich Coast” or Costa Rica. Province of Spain: The first Spanish settlement is established. Several natives are enslaved; others die of diseases brought by the spanish while others are killed protecting their land. The Brunka people discover that their traditional masks of nature spirits scared the “superstitious” Spanish and use them to their advantage to protect their village; The Borucans retreat to a bowl in the highlands in Southwest Costa Rica; about 12 families survive, but their struggle is not over. “By this time, the Borucan tribe has been reduced under the Spanish colonization, struggling to maintain their cultural identity. Natives are forced to provide goods to the Spanish which includes crops and canoe/boat construction. Honoring their Victory: Records show that the “Juego de los Diablitos” was already well established as an annual celebration. It seems likely this festivity included masks, a bull representing the Spanish, and drinking large amounts of chicha (corn brew). As an agricultural community, most Bocurans live from their own land and bartering is most of their economy. People leave for the cities looking for better opportunities. Costa Rica establishes a National Commission for Indigenous Affairs (CONAI) to improve socioeconomic and cultural situation of the indigenous people who represents just 2.4% of the population. Costa Rica passes the Indigenous Law, recognizing 24 indigenous territories inhabited by eight different indigenous tribes, one of which is Boruca, to help preserve indigenous language and culture. The Hollywood Invasion: Some young Borucans living in the city are now exposed to American movies and TV, and bring back superhero masks to their annual “fiesta de los diablitos” celebration; Village elders, including Don Ismael, see this as a threat to their ancestral heritage and consider the teenage generation “lost;” Elders feel an urgent need to train a younger generation to preserve their cultural traditions. Don Ismael’s Mask School: Under strict supervision and guidance by Don Ismael who recruited them, 15 young boys from ages 10-13 start learning about traditional mask making. This marks the birth of the Modern Masks. Education First: Boruca’s first high school opens; 8 boys interrupt their mask training to continue their education. Painting! A couple of artists from San Jose, who have been buying unfinished masks to paint invited 8 boys at their studio; Bernardo and Melvin (son of Don Ismael), travel to the capital every week for 18 months, to study art with an emphasis on drawing facial expressions and painting. Having completed their art training, the young artists seek clients for their work; Bernardo, Melvin, Francisco, Marcos, and others continue working and learning together at Don Ismael’s workshop. Voting Rights! Indigenous people in Costa Rica finally gain the right to vote. Neftali Rojas learns to carve from his brother Francisco and soon begins making masks full time instead of working in agriculture. Soon after, he starts painting them as well. Domingo Rojas sells his first painted mask. At 12, Esteban quits school to work at a coffee plantation when his father died. Selby Gardens: the Rainforest Masks are exhibited for the first time at Selby Gardens; 16 year old Esteban Morales begins learning to carve masks. Don Ismael, recognized as father of the modern mask movement, dies at age 86. 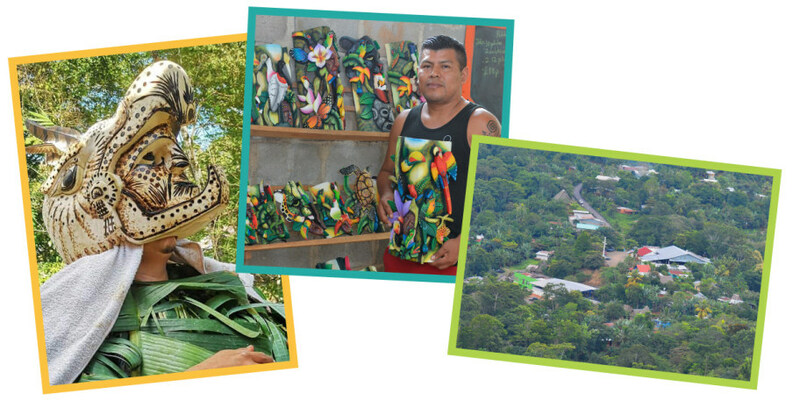 The 15th Rainforest Mask exhibit at Selby Gardens showcases the creativity and artistic achievement of 15 of the best Borucan artists.